SANTA MONICA, Calif. -- The MTV Movie & TV Awards gave "Black Panther" its first taste of awards glory, with Marvel's blockbuster taking home four honors including two awards for its star, Chadwick Boseman. Boseman quickly handed off his best hero award to James Shaw Jr., who wrestled an assault-style rifle away from a gunman in a Tennessee Waffle House in April. 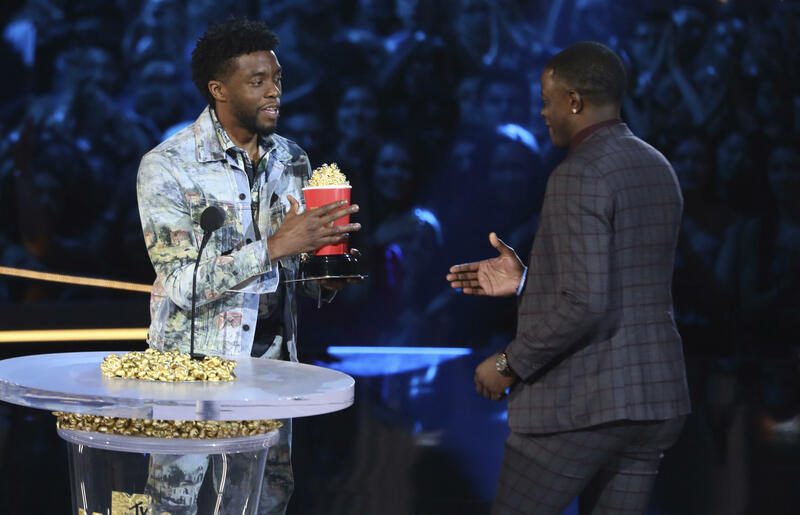 "This is going to live at your house," Boseman told Shaw, giving him the show's golden popcorn award. The actor said while it was an honor to be recognized for playing a superhero, it was more important to "acknowledge the heroes we have in real life." Shaw charged a gunman at the Tennessee Waffle House in April, wrestling him to the ground and grabbing his weapon. Shaw's hands were severely burned from grabbing the AR-15. After the shooting, which killed four people, Shaw said he "took the gun so I could get myself out" of the situation, and that he was glad to save other lives as well. "Stranger Things" was the top television honoree, winning four awards including a repeat win for best show. The awards were handed out Saturday and were broadcast Monday night. The awards show is known for bringing fresh talent to light, as well as acknowledging established celebrities in more quirky categories like best kiss and most frightened performance. Host Tiffany Haddish donned a variety of costumes throughout the ceremony, including nods to classic film and TV roles such as Holly Golightly from "Breakfast at Tiffany's" and Starlet from "The Carol Burnett Show." Will the success of "Black Panther" mean a sequel?